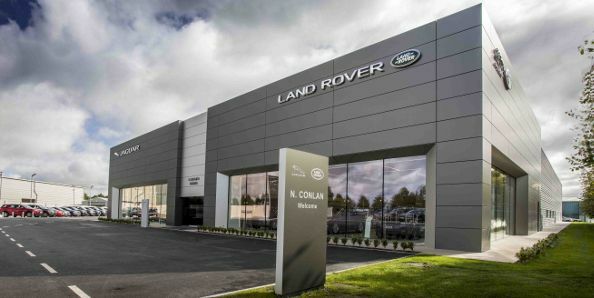 About Us | Conlans Land Rover | N. Conlan & Sons Ltd.
Conlans Land Rover is proud to be the premium Land Rover retailer in Kildare. Our Service Centre and showroom in Naas, County Kildare is a modern first class facility with complimentary Wi-Fi and refreshments and our knowledgeable team within create a friendly environment. Our teams aim is to provide an unrivalled level of customer service, starting with the purchase experience through to maintaining your vehicle throughout its life. Our sales team who are fully conversant with all aspects of the Land Rover range are supported by an experienced team of Service Advisers and Technicians within our aftersales team. We care for you and your Land Rover and know how to help with all of your motoring eventualities. Whether you're looking for a brand new top of the range, Range Rover, Range Rover Sport, Range Rover Evoque, Discovery, Freelander or Defender or a quality assured Approved Used Land Rover, our highly trained dedicated Land Rover sales team are on hand to help you every step of the way. We can arrange a finance package to help you drive away your chosen Land Rover. Buying a Land Rover has never felt so good. • Guaranteed genuine Land Rover parts. Whatever your requirements are we welcome you to the Conlans Land Rover website and we look forward to providing you with the best possible Land Rover experience.